Crucial negotiations in Brussels in the next few days will decide whether the EU’s wasteful fish discards policy will come to an end. Currently, millions of healthy fish back are thrown back into the sea each year after they have been caught, because of the way the EU’s quotas are managed. 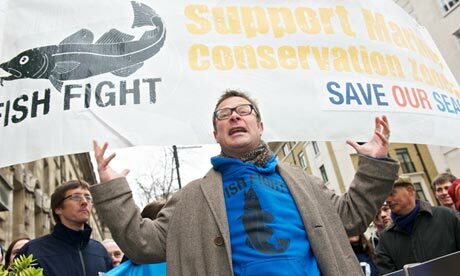 But a ban on discards has gathered huge public backing since the TV chef Hugh Fearnley-Whittingstall made it a personal campaign more than two years ago, highlighting the waste of the EU’s rapidly dwindling fish stocks. He has gathered the support of the UK fisheries minister, Richard Benyon, who will fight for the ban in an EU meeting starting on Monday. This week’s battle will be intense. For the opponents of a ban, including Spain and Portugal, this is the last chance to scupper proposals that would mean the biggest shakeup of the EU common fisheries policy since it was brought in four decades ago. A number of countries and MEPs want to keep the discards system because it allows their large fishing fleets to maximise profits. Fishermen discard parts of their catch when they have netted species for which they do not have a quota, because it leaves more room to take home the species they are after, or when they have exceeded their quota they often throw back smaller specimens. They also throw back lower-value species for which there is less commercial demand. All of these measures allow fishermen to maximise their profits, taking ashore only the most valuable section of their catch and throwing the rest away – even though the discarded fish are healthy and edible. Reform would mean they have to land the whole catch, which should help to stop the plunder of the EU’s dwindling fish stocks. If the reformers win the day, there could be a discards ban in place for many important species within a year, with the rest phased in over the next three to five years. Fishing rights would also have to be set according to scientific advice as to the “maximum sustainable yield”. This entry was posted in Fish, Nature, Wildlife and tagged conservation, European Commission, European Parliament, Fish Fight, Hugh. Bookmark the permalink. argylesock says… eivindburkow at The Coastal House told us, back in February, that a ban on discards had been agreed. http://thecoastalhouse.wordpress.com/2013/02/27/progress-on-discard-decision/ Eivind warned us that there was one more hurdle: final debate in the European Parliament. Now here comes that debate.